Having already doubted his girlfriend’s commitment and dedication, the man in question set about enlisting his friends to spy on his partner so they could catch her unawares. Her despicable betrayal is made even worse as the couple had promised to embark on a ‘journey’ together, with the girlfriend saying ‘new year, new you,’ Elite Daily reports. The boyfriend’s friends though were ready for her downfall and as soon as she slipped up, they photographed the evidence and sent it straight off to him. Horrified, but seemingly unsurprised, he posted the sordid picture on Facebook, for everyone to judge and condemn her for her unacceptable actions. This is why I have trust issues! She promised she wouldn’t cheat again, and assured me that we were in this together. Even though it’s very awkward that it’s a friend of mine that snapped this photo, I appreciate him sending it to me. Following up on the horrendous revelation, the boyfriend decided to release the whole truth on his girlfriend and expose her for who she really is. This girl promised me she would stick to the diet with me! 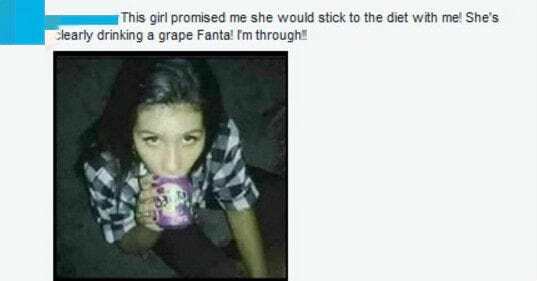 She’s clearly drinking a grape Fanta! I’m through! Her boyfriend was out, probably at the gym or loading up on a healthy meal, while all the time she was sneaking behind his back, unable to control her urges.